Am I the only one who goes nuts over Cream Pan? 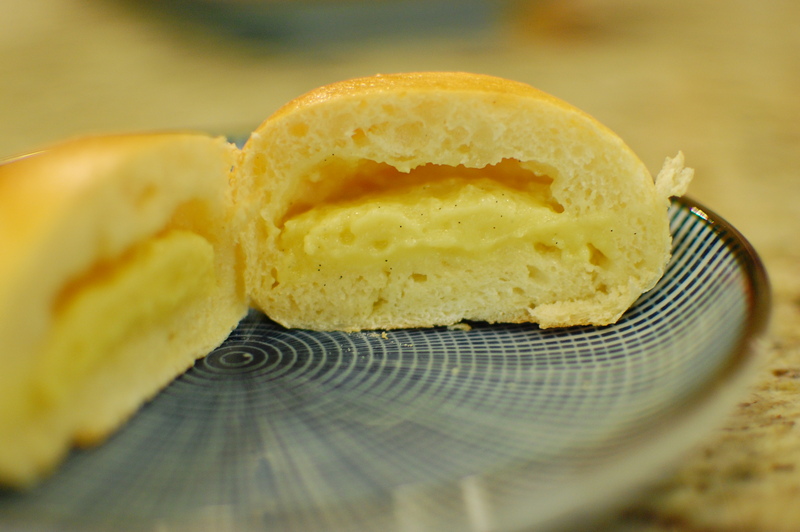 (Japanese sweet bread buns filled with a thick baked vanilla custard.) As a child, I died for these buns. I only got to eat them once in a blue moon… but when I had them… OMG! They made up for everything bad… all unhappiness would be washed away as I got to savor my special treat. 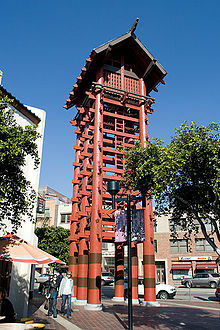 My mom would take me to Little Tokyo in downtown Los Angeles for a day of shopping when I was a kid. I always dreaded going… because it was usually a 1 – 1.5 hour car ride to get there. Not that it should take 1 -1.5 hours to get there… anyone else could make it there in 30 minutes. However, my mom (without fail) would always take the wrong ramp, and get us on the wrong freeway at the last minute. ”Left, mom, stay on the left! No, the left! You need to stay on the 101, don’t get on the 110! Mom, you’re in the wrong lane. No, don’t go that way – go to the left! The left! THE LEFT! Nooooo…. not the right!!! !” She never listened to me… and ALWAYS got on the 110… then we’d end up lost among the one-way streets, and somehow *I* was the one who needed to navigate us back to 1st Street and San Pedro. (Sigh) Stressful times for a 3rd grader. But then we’d get there eventually… we would have lunch, then do some shopping. After getting a new pack of origami paper, and my Cream Pan, I was happy. It’s so hard to find good Cream Pan these days. Sometimes Mitsuwa market has packages of Cream Pan for sale (loaded with preservatives for long shelf life)… but they are never the fresh bakery quality ones I remember from the old corner bakery at the Little Tokyo Village Plaza. I’ve been thinking about cream pan a lot these days… now that I’ve perfected my Japanese Milk Bread recipe, and figured out how to make An Pan (Red Bean filled sweet buns), why not give Cream Pan a try? While making the buns this time, I figured out an easier technique for filling the buns before baking. I used to just hold the dough in my hand, put a ball of filling on top, and attempt to awkwardly wrap the dough around the filling and pinch it upwards. Instead, this time, I lined a small custard cup with the flattened dough circle – put the filling in the depression, and pinched up the dough on the sides. This was much less awkward, and about 1000 times easier (especially with a rather soft filling like this custard)! For more info on the dough itself, please see my post on Tangzhong and Japanese Milk Bread. 1. Make the tangzhong. In a small saucepan, gently heat the bread flour + water, while slowly whisking. When the mixture thickens, and swirl lines appear – remove from heat and cool. You will only end up using half of this mixture – store the other half in the refrigerator (covered) for up to 3 days. 3. While the dough is rising, make the custard cream. 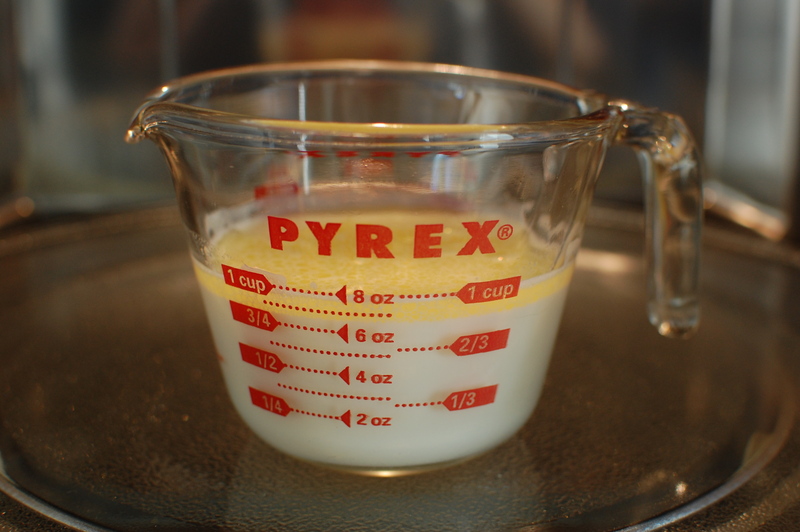 Scald the milk and butter in a large pyrex measuring cup by microwaving for 2-3 minutes. 4. 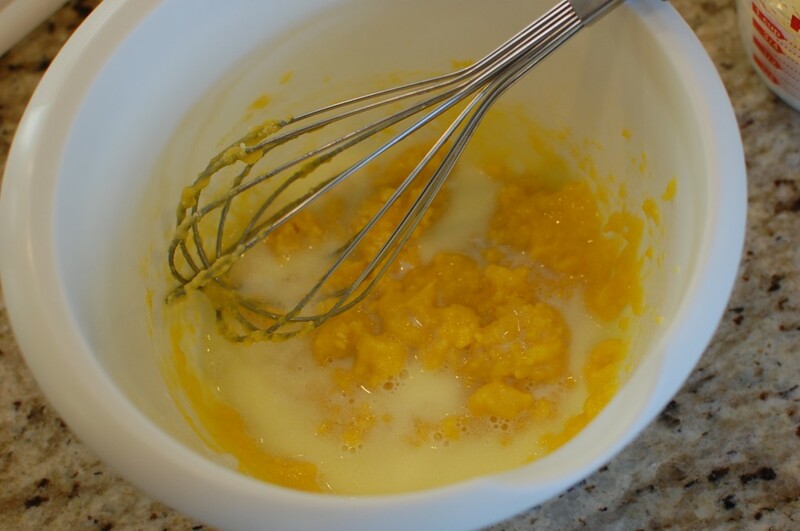 Beat the egg yolk with a whisk, and add the flour, cornstarch, salt, and sugar. 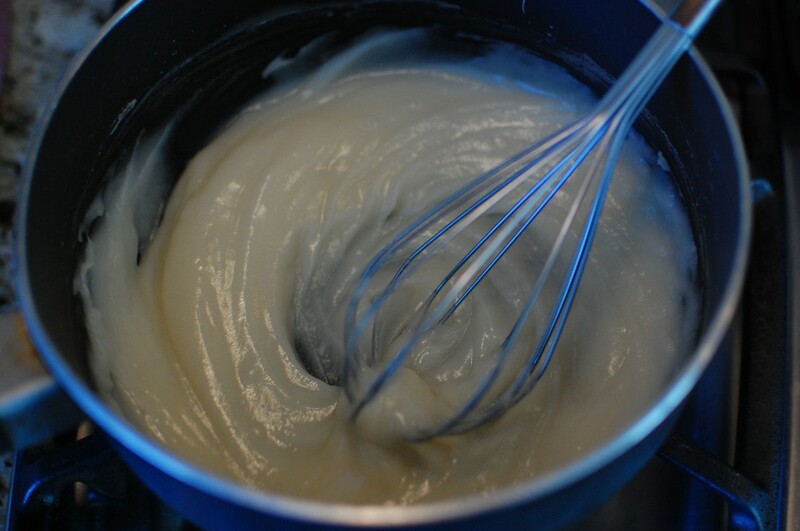 Whisk together to form a thick paste. 5. 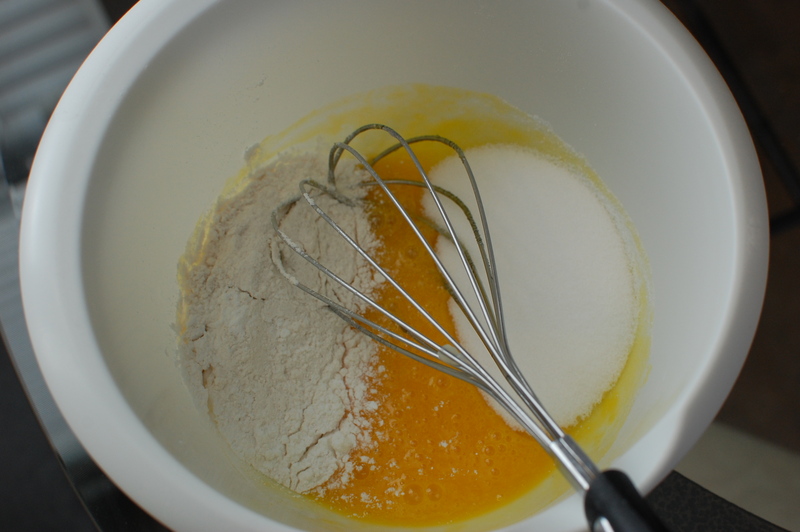 Add about 1/3 of the warm milk mixture to the paste, and whisk constantly. (This step tempers the egg, and loosens up the paste so that you can add the remaining warm milk.) Add the second 1/3 of the warm milk, and whisk until combined. Then add the last 1/3 of the warm milk, and whisk until combined. 7. Add the vanilla bean paste (or vanilla extract, or scraped vanilla bean guts), then slowly heat the saucepan over medium low heat (whisking constantly). 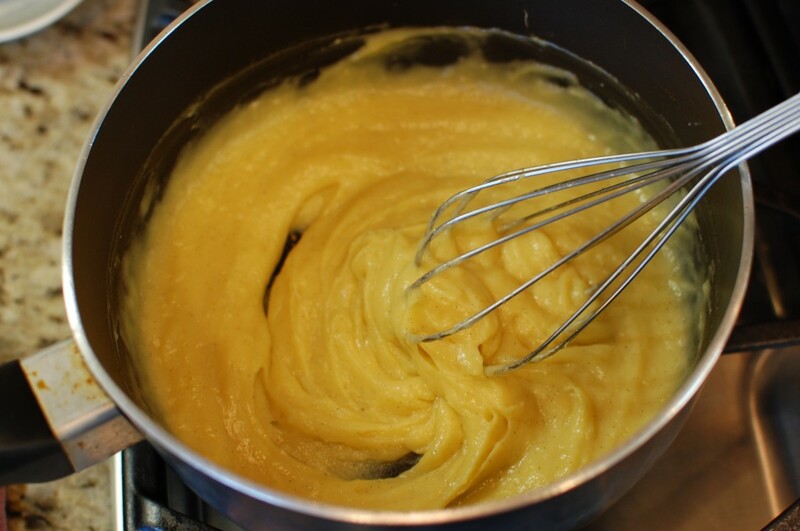 When the mixture thickens so that swirl lines appear, remove from heat and continue whisking another 30 seconds. 8. Refrigerate the custard cream until cold and thick in a covered container for several hours. 10. 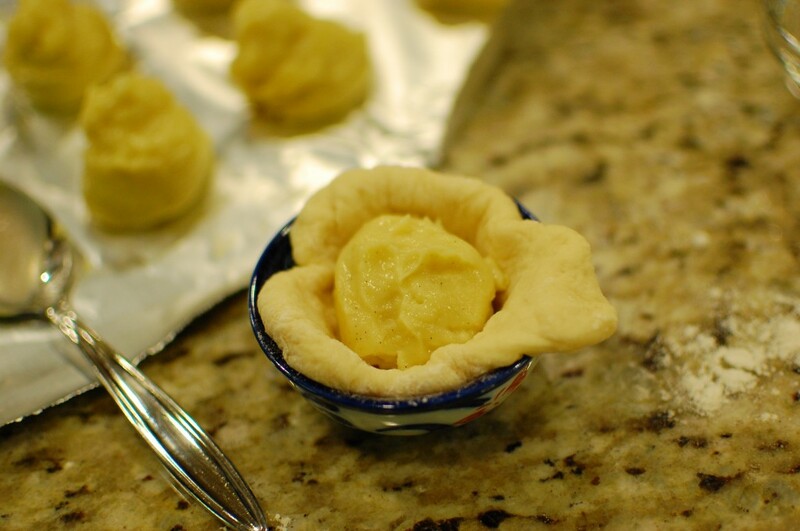 Flatten each piece of dough with the palm of your hand and place in a small custard cup. Use a small spoon to put a portion of chilled custard into the depression. 11. Pinch the edges upwards to seal and place seam side down on a silicone lined cookie sheet. 12. Cover with plastic wrap and allow to rise for another 30-60 minutes. 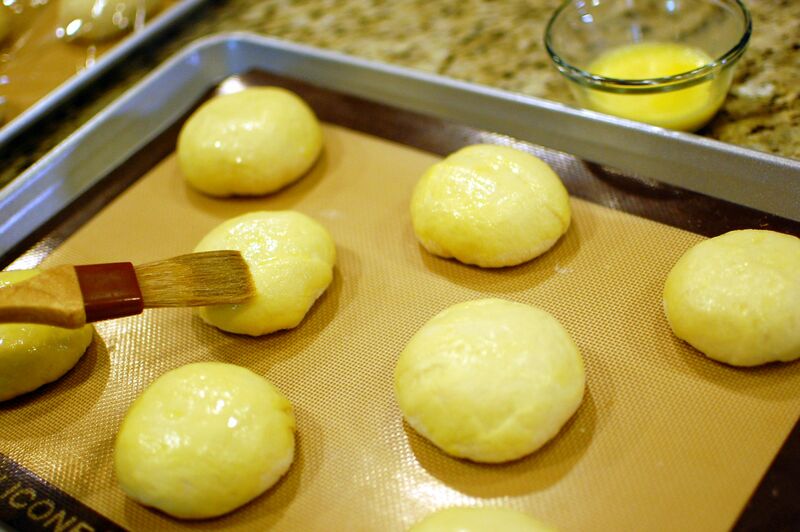 Brush the tops of the buns with the egg wash, and bake at 335 degrees for 15 minutes. 13. Remove from oven and cool thoroughly. Refrigerate to store. THANK YOU! THANK YOU! ARIGATO GOZAIIMASU! I absolutely LOVE custard pan, I buy all that I can find at the Mitsuwa’s in Costa Mesa. However, being that I live in the inland empire, I am not able to go there very often, I buy it at the little bakery there, Now i can make it myself! thank you so much! Hi Patricia! So glad I could help! I was really surprised how there are really no recipes for Cream Pan on the internet… but it’s not really that hard to make (especially if you have a bread machine to make the dough). Hope you like it! Thank you for the recipe. I was wondering what is “T” mean on the measurement? Is it Tablespoon or Teaspoon? “T.” is the standard abbreviation for “Tablespoon”. “tsp.” is the standard abbreviation for “teaspoon”. Hope this helps – and let me know how the recipe works out for you! I’ll have to check out that bakery next time I’m in OC… sounds like they have some yummy stuff! Let me know how your cream pan turns out! Jannah, I’m glad it worked out! Thanks for the feedback! Hello! I’m new to your website and I simply love it. I’ve been really into Japanese cuisine especially the sweets and baked goods. I’ve made melon pan and chocolate cornets, but now I’m in the process of making your cream pan! I’m so excited to see how they are gonna come out! (I halved the recipe because I’m not suppose to eat bread…hehe) Thanks! Funny you should mention chocolate cornets… I’ve been thinking of attempting those soon! Let me know how your cream pan turn out! You really should! They are really easy and so cute when done! The cream pan came out well! I kinda messed up a few because I made the dough too thin before I put the custard in and it came out a little, but the taste was there! I can’t wait to try it again! Yay! The first time is always a learning experience. Next time you make them, I’m sure it will be perfect! Stumbled across this recipe today and decided to make them since I had all the ingredients on hand. They turned out AMAZING and so so tasty. They definitely taste just like the ones I used to get at the Asian Market. The recipe was super simple as well (I made the dough by hand and it wasn’t really even that much extra work). Going to give the Melon Pan a try next week! Thanks for the feedback – I’m so glad yours turned out. It took me a long time to figure this one out… but I was really happy when I did! I’m from the other side of the Earth – Singapore. I really appreciate your explicit written demonstration of making the custard cream buns. I just tried out the recipe, and it showed excellent result. These buns will be our tomorrow’s breakfast. Hi Ngai! Thanks for your feedback! I’m glad the Cream Pan recipe worked out for you! Yes, that is correct – it is 1 3/4 c. milk. When I took the photos, I was experimenting with half recipes… to make sure I got the custard just right before posting the final recipe online. Once the custard is cooked, it becomes the consistency of pudding. When you refrigerate it, it becomes a little bit stiffer and easier to scoop. the custard after chilled, does it has to go back to room temperature before we put it in the dough and shape? No, that’s not necessary. The purpose of chilling is to make it easier to work with and scoop-able. It holds it’s shape easier when cold, so it is easier to stuff the dough with the custard when chilled. Hope this helps! I tried the recipe today. The bread turn out pretty good. 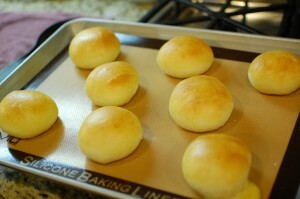 Except they are rather flat instead of round shape after bake like your. The custard is rather soft even after being chilled so it is a bit difficult to shape in the dough (even with your trick). Maybe I didn’t cook the custard long enough before chill. Thank for sharing the recipe. My favorite so far is the coconut milk bread. BTW, do you store the custard bread outside or refrigerate? Hi! When you cook the custard, you want it to be thick, like pudding, when warm. When you chill it (overnight is best) – it should get even stiffer – but it won’t be thick enough that you can handle it with your fingers (you will need to scoop it with a spoon or cookie scoop). Once you make your dough, you wrap the custard and allow the dough to rise a second time in a warm place. Don’t skip this step or the buns will not be nice and round. Because the custard contains eggs and milk, you want to refrigerate it even after baking. Hi! I made this today and it was the most successful batch of soft buns that I have made. However, the dough was a little wet so I’m not sure if I got the measurements correct as I used a conversion ratio from the book healthy bread in 5 mins a day. Would be grateful if you can provide the recipe using metric weight. Many thanks! Hi there! I’m glad your buns worked out well. The dough is a little bit sticky, so as long as your buns were good, it doesn’t sound like you made a mistake. There are a lot of recipes on the internet giving metric measurements for this type of bread dough, and very few giving American-style volumetric measurements – which is one of the reasons why I posted this recipe as it is! Unfortunately, I do not typically weigh the flour – so I can’t give you an ounce or gram weight for the flour. I normally use American style volumetric measuring cups for flour, sugar, etc. Can you get a set of volumetric cups? If not, if you have mL style measures, 1 cup = 240mL if that helps. Sorry! How long can you store the custard in the frideg? 3 days? You can store the buns for up to 1 week refrigerated. If you store the custard longer before baking, it does reduce the shelf life of the buns… it is an egg based custard, so you need to be careful watching for signs of spoilage. I made this tonight. So simple! Went off without a hitch. Tasted and looked wonderful. I cheated and shortened all the rise times by a bit to get them finished before the kids went to bed. In retrospect, I think I’d want to mix the pan ingredients more conventionally; I did it by hand, and the ‘throw-them-all-in-together” style for a bread maker works fine, but I kept seeing little yeast crystals throughout the process. Great recipe! Custard is even more fabulous after baking. Hi Rebekah! Thanks for the feedback! I’m glad the recipe worked out for you. What is “1/2c tangzhong?” I found that there is a “tangzhong” method…? If you take a look above, I have a recipe for tangzhong just underneath the recipe for the dough. In step 1, I explain how to make the tang zhong…. 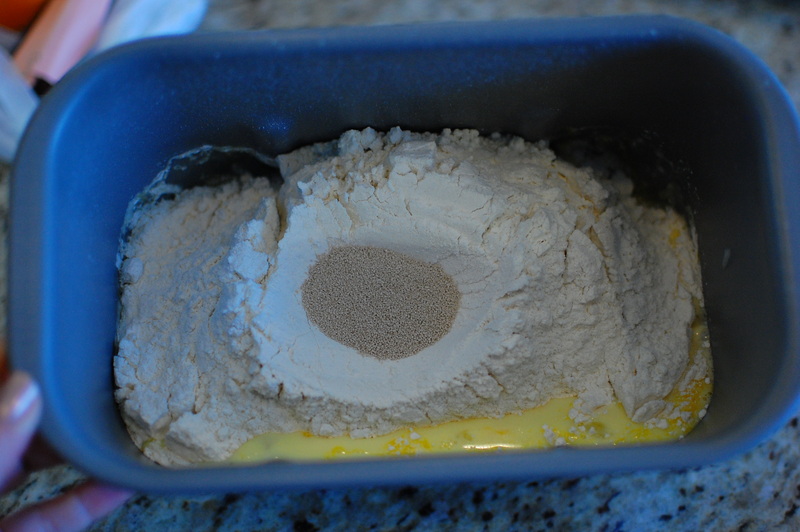 basically combining water and bread flour in a sauce pan, and cooking gently to make a thick paste. Once cooled, this thick paste serves as a dough conditioner that gives Asian breads that soft fluffy quality. Let me know if you have any more questions! I stumbled on this recipe and I can’t wait to try it! I do have a question, when making the Tangzhong, do you add the water a little at a time to the bread flour or all at once? Hi Kellie! I usually just add both the bread flour and water to the cold saucepan all at once. Then, I turn on the heat and begin whisking (constantly). It cooks very fast, and turns into a smooth paste. 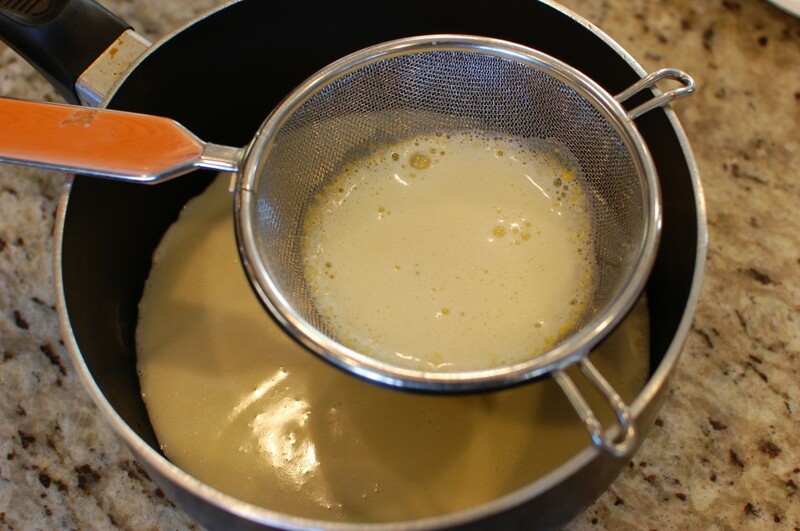 As soon as it thickens (you will see it gel at a certain point) – and as you are whisking, you can see that your whisk is leaving a trail of swirl lines – stop whisking, and remove the pan from the heat. hi, for the cream pan dough, is it okay to use all purpose instead of bread flour? will there be a substantial difference? thanks. Yes, you can use AP flour. Results will be a little bit better with bread flour, since it has higher protein content for better gluten development. If you are using a high protein AP flour (like King Arthur) that would be better than a lower protein bleached AP flour (like White Lily). 1. i would like to know how to use the 2nd batch of tangzhong that’s been kept in the ref (2 days now). do i heat it again? 2. do you have a dairy-free tangzhong bread? no butter, eggs or milk? 3. how do i make tangzhong with other bread recipes out there? is there a formula? 1. If you are using a bread machine, just dump the cold tang zhong in the bottom of the pan before you add the rest of your ingredients. If you are mixing by hand, I would bring it up to room temperature first. But no – you should not heat it. 2. If you want dairy free as in lactose-free, you can use coconut oil instead of butter, and coconut milk instead of milk. However, I don’t have a substitution for the eggs if you have an egg allergy or are looking for a vegan recipe. 3. For other bread recipes, I usually just add 1/2 cup of tang zhong to the recipe with no other changes. You might need a bit more flour when handling/rolling out, but other than that I haven’t had to make any proportion changes yet.. I grew up in Japan and I cannot find anything over here in the states that comes close to this and their curry buns!!! I LOVE YOU SO MUCH THANK YOU!!!!!!!! I tried my hand at this recipe and know I have to practice more, but it turned out pretty good! What other things can be used instead of custard? I like how the custard came out, but I don’t know what else can be placed in the middle. By the way, this is such an awesome blog! You can use all sorts of fillings… sweet red bean paste, sweet mung bean paste, sweet mashed taro… jam, peanut butter, chocolate chips… whatever you like! Thank you! I’ll try those next time! Can I substitute active dry yeast with instant yeast? If so, does it change the procedure, and what measurements would I have to use? Also, can I substitute all the bread flour this recipe calls for with all purpose flour? Finally, for the custard, is it possible to reduce the amount of eggs? I think the recipe should probably still work with instant yeast. I haven’t tried it myself though – so I’m not 100% sure. You would probably use the same amount of yeast. You can use AP flour instead of bread flour – but it does change the protein content of the flour a bit, and you might not develop as much gluten. But overall, you shouldn’t notice a huge difference – although the dough might not rise quite as much or have the same exact texture as if you used bread flour. For the custard, no you cannot reduce the amount of eggs. If you did, the structure will fail, and your custard recipe will not turn out correctly. I’ll have to give it a try next time I’m in the area! I was wondering how you would recommend storing these delicious buns (If there are even any are left to store) and for how long? You could probably keep these up to 5 days, stored in the refrigerator. (Wrap in plastic.) Microwave for 15-30 seconds to take the chill out when you want to eat them. Hey, I was just wondering, if I wanted to make this without using tangzhong, how much flour should I use to substitute? i want to ask would this work if its steamed? I’ve tried it steamed… and I didn’t think the dough worked as well being steamed. 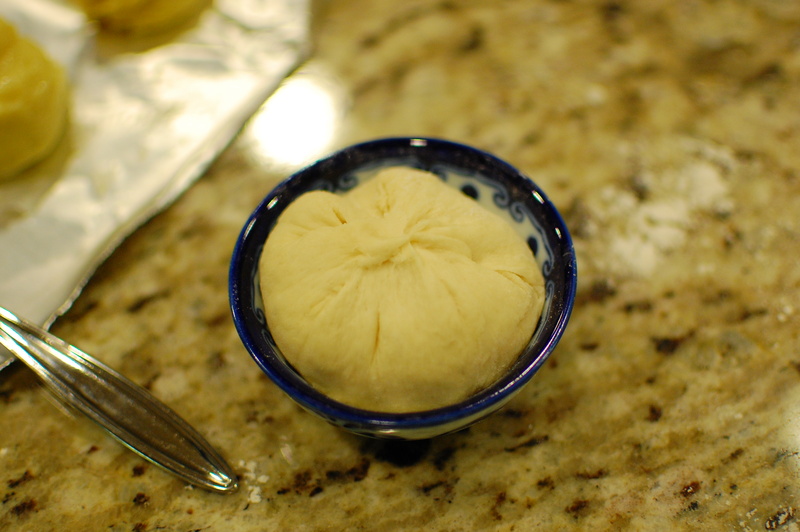 If you are interested in making a steamed version, you could try using the dough in my Liu Sa Bao recipe instead… that’s more of a steamed bun dough, and will turn out much better. Mine are currently in the oven! First I used the breadflour but that dough was sticky beyond belief and the cream was delicious to just eat with a spoon so I remade the dough with allpurpose flour and it was workable. I am really curious how they will turn out! Normally, I don’t make this dough by hand – because yes, it is a sticky dough. Resist the urge to add too much flour, because it will make your end product dry – maybe oil your hands instead. The difference between bread flour and all purpose flour shouldn’t be that much in terms of stickiness – but as bread flour will allow you to develop more gluten (because it is higher in protein), it WILL be harder to knead by hand. Although the gluten makes it harder to knead, it gives the bread a better structure… so your end result ends up much better. You can make these with all purpose flour, but your final product (the bread part of the cream pan) won’t be quite as good as with bread flour. Glad you like the filling, hope it works out in the end for you! Hmm the only breadflour I found here are those with different kinds of wheats and it had seeds in them, at first I sifted the flour but the smaller seeds still found their way into the dough. But I took them out and it’s still very good! I will definitely make these again! The bread is fluffy, even with the APflour! Yay! Glad it worked out for you in the end! That sounds like weird bread flour… I wouldn’t use that. I use just regular white bread flour made with processed/bleached wheat. If the flour is whole wheat/whole grain… and has seeds in it… that’s probably some weird type of “healthy flour” – not regular bread flour. Whole grains or whole grain flour are another animal, and behave much differently (they tend to be much more dry) when making dough – so that could have been the issue. THESE ARE AMAZZZZZZZZZZZZZZZZZZZZZING. Omg you have made my life complete. I miss these so much from Japan and this recipe is perfect. THANK YOU, GENIUS WOMAN! Oh! And your directions are nice and easy to follow, I liked that. Great job there! P.S. I was a little bit worried about making the bread…. I’ve never used a machine for it before, don’t have one, I’ve just always done it by hand. So double thanks for the by-hand instructions. Hi Brittany! Glad it worked out for you! You kind of have to play it by ear. You definitely want to knead it a good amount… I would say at least 10-15 minutes. At that point, stretch a small piece of the dough as thin as possible… if you get a “windowpane” effect (really thin area that you can see light through) then you can probably stop and then leave the dough to rest and rise. If no windowpane, you want to continue kneading a bit longer… maybe another 5-10 minutes. It all depends on the protein content of your flour, and the environmental conditions on the day (and location) you are making it. Hi, What kind of milk do you use, full fat, 2%, 1% or fat free? I normally use 1% milk because that’s what I have in the refrigerator. I’m sure you can use whole milk or nonfat with no major problems – there is plenty of fat already in the egg yolk and butter, so the fat content of the milk shouldn’t matter too much. One more question. If I am using a KitchenAid mixer with a dough hook attachment, how long should I process the dough for? Thanks! I would probably go 10-15 minutes. 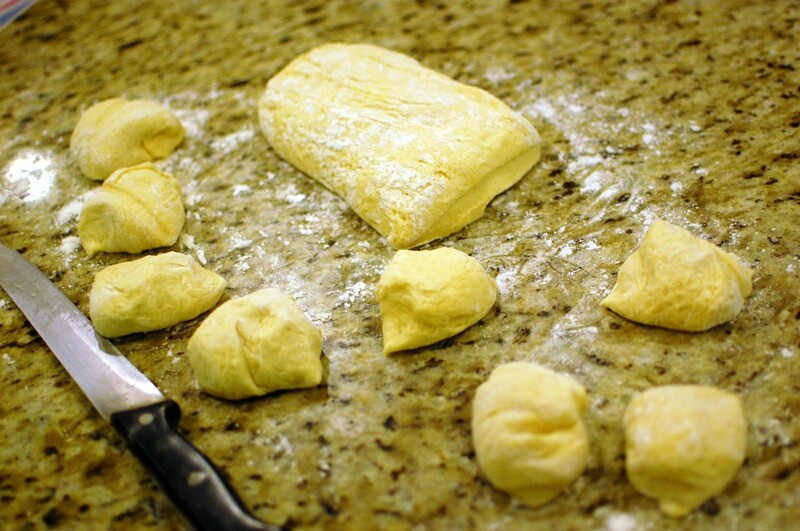 At the 10 minute mark, check the dough – take a small piece and stretch it with your fingers. If you can stretch it really thin so that you can see through it (aka “windowpane”) then it is done with the kneading step. Thanks for sharing this recipe. I happened to have a 4 year old son who has a sweet tooth like me! Like you said, it is better to make our own bread than buying at the store. We live in Santa Barbara, CA and our little Japanese store stock up limited bun, they cost about $2.50 a small bun. Expensive I know. I really admire you all who live in LA. Anyways, I don’t have a bread machine or Kitchenaid, just going to try it by hand. What brand of bread flour do you use? For bread flour, I normally just use the supermarket brand. Albertson’s has their own brand of bread flour, and that’s what I buy because it’s a little bit cheaper. I’m not in LA though… down here in San Diego we are quite limited to as far as Asian/Japanese groceries are concerned! I can drive up to OC (1 hour north) or drive down to the Convoy area of San Diego (35-45 minutes south) to hit up Mitsuwa… but nothing that close! That’s why I started just making bread and buns myself at home. We are in the same boat then. I really admire all your homemade recipes and have a lot of gratitude that you are sharing them with us! I am proofing the dough right now. I decided to use white flour since I read one of your readers use it with success and that is what I have on hand. But will buy bread flour from Albertson’s when I am done with this. Let me know how it turns out for you! I know I wish I had an Asian market or bakery closer… but… it is somewhat satisfying having it fresh baked at home, knowing that I made it myself! I just read your reply below! My custard didn’t get thicker for some reason but worked out ok after all. How do you store the pans? It was very soft and yummy when its warm but this morning outside is a little hard but soft inside. Because the filling is a custard, I usually store them in a tupperware container in the refrigerator. You can microwave the refrigerated cream pan for 15 seconds (up to 30 seconds maybe) to take the chill out before eating. The custard (once refrigerated) should be thick enough to scoop – the consistency of a thick pudding. You just have to make sure you cook it long enough for the starch granules to swell, and then chill it thoroughly before using. Thank you for sharing this recipe. Creme Pan is my husband’s favorite thing in the whole world I think and since we moved to NJ, it is so much harder to find a good asian bakery compared to the West Coast. I’m so excited when finding your recipe online! One question for you, do you proof the active dry yeast first, or do you just put 2tsp of it in the batter? Thanks! Hi there! Because I use a bread machine to mix the dough, I don’t proof the yeast at all. If you are not using a bread machine, and are instead mixing this by hand, I would add the yeast to the room temperature (or slightly warmed) 1/2 c. milk called for in the dough recipe, and let the yeast dissolve/bloom for 3 minutes before adding the mixture to the rest of the ingredients. (Oh, and if you are mixing by hand, I would melt the butter first before using). Made them last night, and they are delicious!!! Thank you for sharing this recipe! Thank you very much for posting this recipe. I really appreciated. Thank you for this wonderful recipe! I doubled it and made it for friends. Husband tasted it and couldn’t stop eating them! Friends finished 2 dozen in less than 48 hours! I’ve made this two days in a row! Thanks for your comment! I’m always happy to hear when my recipes work out for people. Hi Mika! My bread machine has only a 1-lb capacity. If I use it to knead the dough, how should I scale down the quantities of the ingredients used? My bread machine will allow for a 2 lb. capacity. So I would recommend cutting the recipe in half. Let me know how it turns out… good luck! Hi Mika, I tried this recipe out tonight and the cream pan is very good. For me next time I would make only 1/2 of the custard because I would like to taste more of the bread. Hi there! That’s the great thing about making your own recipes at home (vs. buying them)… you can tailor them to your individual likes and dislikes! I’m glad you liked it! I’m so mad I didn’t find this recipe before I went gluten-free last month! I used to live in Japan and would kill for one of these! You could try making it with GF flour…. I’ve never done it, but it’s worth a shot, right? You’re welcome! Glad it worked out for you. This is one of my favorites! Hello Mika, l gave this recipe a try and the cream pan came out great. Well, I can say am pleased with myself since its my 1st attempt ever at baking bread. My children live it too. But my cream pans are not well rounded like yours even though they were well rounded before baking. They stayed flat when they came out of the oven. What is wrong? These turned out great! Thanks very much for the recipe, the bread is just perfect. I found your website while reading the recipe for Japanese Milk Bread on the website Gluten Free on a Shoestring. Nicole Hunn said she adapted your recipe to be gluten-free. Since I was just diagnosed with celiac disease, I will never be able to eat anything with wheat ever again. The Milk Bread will be tried out tomorrow. Then I decided to check the original source (you) and found the Azuki Milk Bread and these Cream Pan. Since my children’s paternal grandmother is from Okinawa, we are always looking for Japanese treats to honor their heritage. I am going to ask Nicole Hunn for help in adapting your other Japanese breads to gluten free, if that is all right with you. They sound so wonderful. I will be spending hours exploring your site over the next few days. Thanks so much for the original recipes! That’s great! I’m glad it worked out. Did you use gluten-free AP flour? Yes, it’s best to always preheat the oven unless specifically instructed not to! Glad to hear it. Thanks for the feedback. I couldn’t find many recipes online, so I just decided to figure it out myself. Hi there. I’m attempting to make these for the first time and I have run into a snag. 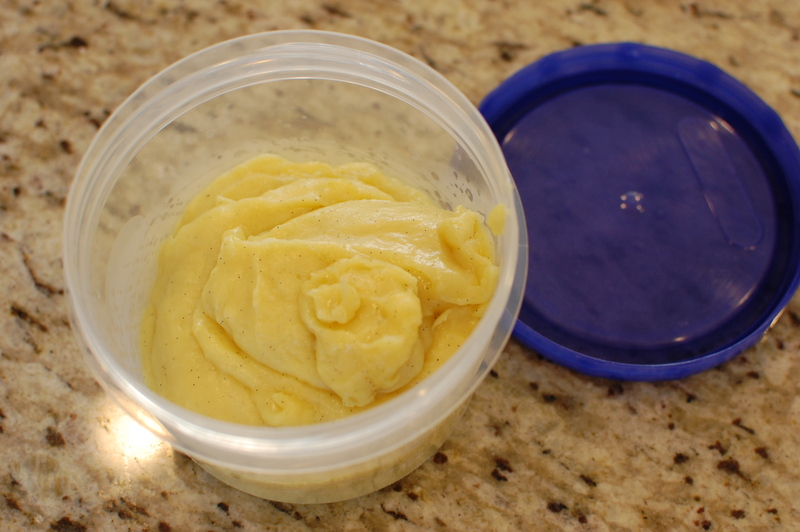 I’ve already made the dough and just finished up the custard… Will the dough keep until the custard is cooled? If not can I put the custard in the freezer to quicken the cooling? So happy I found this recipe and I’m hoping they are as delicious as all the reviews say they are! Yes, the dough will be fine until the custard is cool – I have even put the dough in a ziploc bag and refrigerated overnight and it turned out fine (just allow to sit on the counter for 30 minutes to take the chill out before proceeding). Thank you! I was worried I had ruined it! I can’t wait to bake these bad boys tomorrow! You’re welcome. Hope it turns out well! i don’t have a silicon lined cooking sheet. does it matter? No, I like to use silicone mats because they protect the bottoms from burning and are non-stick. You can also use parchment paper, or a lightly greased cookie sheet. Yum, these were incredible, thanks so much! This is the first time I’ve made cream pan and my family loved them…the 4 of us ate 10 of them in one sitting. I will definitely make these again. I’m glad it worked well for you! I’ve made these a couple of times now and they are always perfect. They have become a school holiday request in our house and I have to make at least one batch every holidays. They are very yummy. Thanks for the recipe. hi, i wants to make mini melon pans with cream filling. do you think i can make these, and add the melon pan cookie top on it?? Sure, I don’t see why not. Why don’t you try it? These are terrific!! I didn’t have bread flour but I had all-purpose flour and it worked great! Thank you that I found your website all the recipe that I love was there.Thank you so much and Happy Thanksgiving. I’m glad you found recipes that you like here. Thanks for your kind words, and Happy Thanksgiving to you too! Thank you very much for this recipe. I have tried both the japanese milk bread recipe as well as the cream pan recipe. Both have worked out great. I think I overstuffed the cream pan and some of the cream oozed out. Nevertheless, my japanese wife is very impressed. Tomorrow we will host a thanksgiving dinner for some japanese friends and we will send the cream pan as omiyage. I appreciate how easy you have made the recipes to follow. You’re welcome! I’m glad it worked out for you. Cream pan is one of my favorites, and it always tastes the best when freshly made! I have a small question. If I wanted to use tangzhong in other recipes for japanese breads that do not list it as an ingredient, should I reduce some of the flour or moist ingredients called for? I have tried adding tangzhong before with no substitutions and it seems to work ok in everything I have tried… but I probably wouldn’t add it to something that’s more like a European style bread with a crusty outside. You can try it more for softer or fluffier breads. Hi Mika! Where can I find Tangzhong? Do I have to go to a specific Asain market? Like a Japanese/Chinese one? If you have a look at step 1 in the recipe above, I explain how to make the tangzhong. It’s just a mixture of flour + water that you heat on the stove top while whisking. You make it, you don’t buy it. I’ve been making your KK donut copycat for a while now, and I wanted to give it a little twist, so I read this recipe and had an idea if I could use the cream for filling in the KK copycats, and then fry it. Do you think this idea could work? or is the custard cream only prefferable for baked breads instead of fried ones? thank you for your great and very helpful recipes! I’m from the Philippines. You could certainly try it. It’s a cooked custard to begin with, so you don’t need to cook it a second time. I would just use a pastry tip and bag to fill your fresh cooked donuts with the premade cream pan filling and see how that turns out. Let me know! I made these by hand today and even though it took quite some time they came out wonderful! Thank so much for sharing this recipe– my parents really loved it! in your recipe you should’ve mentioned that using a hand mixerr would be easier to mix the egg mixture from the custard. i used a whisk and it ended all up in the whisk and i had to redo it because i could not get it out of the whisk. I usually use a whisk, and never use a hand mixer. I’ve never had any problems with this. If you get batter stuck inside your whisk, just take a butter knife and pull it out. This recipe sounds super delicious. I have a quick question – can I make the custard cream a day before making the bread and place it in the fridge until it’s ready to be used? Yes, you can make the custard ahead of time – I often do this to save time and it is usually fine. It makes 16 buns. Good luck! I made it just now, it’s in the oven now!! And can I mention that it smells FANTASTIC Thanks for the great recipe!! The pastry filling is now my go-to for all recipes that use it! Not only used it to make cream pan, but also mocha cream bread. Thank you for posting! Great! I’m glad I could help. Mocha cream bread sounds amazing! Mika! I made your recipe today, and the cream pan was delicious! I don’t normally comment on food blogs, but your recipe is fantastic! I feel so proud for making it. Thank you so much for sharing it! You’re welcome! Thank you so much for your kind words. Hi Mika…if you’re ever up in Sacramento, check out Maharoba Japanese bakery on Freeport. They make a pretty good cream pan called a Kobe Cream. They have a matcha custard version as well. Lots of good stuff. My favorite is the strawberry anko cream. Wow strawberry anko cream sounds delicious! Hopefully I can try it one day. Hi there! Thanks for the lovely recipe. I’ll have to make these in 2 batches. If I make all of the buns, will half of them be okay to sit in the fridge while the first half cooks? Or should I wait until the first batch is cooked and then make the other half? I think you can do either. The unbaked buns should be ok in the refrigerator – just cover with plastic wrap to prevent drying out, and allow them to come to room temperature for about 30 minutes before baking. Thanks! Ended up just covering them on the counter while the first batch baked. They turned out yummy and cute! THANK YOU! They came out delicious. Hi- thanks for the awesome recipe!!!! When I bake the cream pan, the cream very easily expose, comes out from the pan. It is really a problem Can you help me to resolve the issue? Make sure you are pinching the seams of the dough together well – use a little bit of water to help make the seams seal if needed, also make sure you bake seam side down. You can experiment with baking for a slightly shorter time. Alternately, you can experiment with freezing the scooped balls of filling before making so that they are still cold when you start the baking process. Previously when I made Japanese cream pan, the filling always came out. Now I make sure the temperature is less than 350 F and the filling is thick enough. In such way, I am able to successfully make Japanese cream pan!! Thank you very much for your suggestion! Hello! I can’t wait to try these, as I LOVE Japanese food! I am just wondering whether there is another way of making these without using the bread maker? I don’t have one, and it will be a bit hard to go and buy one just for the purpose of making this recipe. Yes, you can knead the dough by hand, then allow to rise, then punch down and allow a 2nd rise. I just wanted to thank you for this wonderful recipe! I’ve actually been baking this recipe and just the bread on its own (as well as the coconut version) for four months now and it’s perfect every time! And I don’t even have a bread machine… I used to knead by hand and tell my husband that it was kneaded with love :p but now i’m lazy and just use the dough hook on my mixer. By the way, I think I’ve read one of your readers’ comments before asking about how to half the tangzhong? I always use 2 tbsp and 2 tsp of flour with 1/2 cup water because my Cuisinart 1/2 cup says 79ml while my Cuisinart tbsp says 15ml and tsp says 5ml. Hope this helps your readers! Will be trying these out really soon! Thank you! Hi Mika! The recipe looks really tasty so I am going to sell these when raising money for our school . Just one question: can I freeze the buns after they are baked? If yes, for how long? Will the taste stay the same? You probably could, but I wouldn’t freeze them too long… make sure they are tightly wrapped in plastic to avoid freezer burn or off flavors. Hey thanks for posting this recipe. I tried making the custard cream but for some reason it seems a bit salty and I’m afraid that I may have messed up somewhere. I did follow the recipe to the letter but I think it was actually just me. After a second attempt at it the custard turned out great as did the cream pan as a whole… loved it thanks so much for the recipe. I did twice and it works perfectly! HOLY MOLY These are so amazinggggg I ate one fresh out of the oven and oh ma lord they are delicious!!! Hmm I try you bun in later date if there was way incorporate dried strawberries into custard is that after or during cooking process? I’m using cream pan and experimenting with pineapple buns from this site currently. http://thewoksoflife.com/2015/04/pineapple-buns/ <- no offense intended I just want to see how tasty it would go but if does come out like needs something make go tasty…custard alone was suppose to be sweeter or should I have used superfine sugar? I think for taste buds it went rather well I used whole milk and custard came out rather well without any strange egg issues. Just makes me question could we used dried fruit or strawberry jam to add to cream pan or is that no no? Hi there. I don’t see why you can’t add strawberry jam to the custard? Sounds like an interesting variation! I tried your recipe for the first time today and they are delicious! However, I have a question. When I baked the buns, the filling busted at the sides or at the top. What did I do wrong? I followed your suggestion using teacup and thought I cinched them tight. Did I roll them out too thin in some parts of the dough? Also, my kids loved eating the chocolate cream buns while we visiting Japan. Any chance you have a recipe for that? Thanks for your recipe. Did the seams burst, or did the filling burst out through the wall of the dough? If the seams burst, then I would moisten the seams with a bit of water and pinch several times, bake seam side down to ensure a tight seal. If the filling burst out through the wall of the dough… I would guess that a lot of steam was created internally which compromised the integrity of the wall – so maybe the dough was rolled too thin, or maybe the oven is too hot (try cooling the filling or freezing the filling before baking)? Hi, I was wondering if it would turn out ok if I were to put frozen berries on top of the cream mixture if it would turn out ok? Thank you for the recipe it looks simple! I would worry that the extra moisture in the frozen berries might make it soggy. You could try it… I almost think that jam would probably work out better than fresh or frozen fruit. does the butter for the dough have to be melted? If you are using a bread machine to make the dough – then no, you don’t have to melt it. If you are making the dough by hand, then you may want to melt the butter. I made this recipe at least 5 times and it worked wonderfully and everyone absolutely goes crazy over it! I just find the dough always sticky and I have to do minimum handling when flattening and filling with custard. Is this normal or it shouldn’t be sticky? It is normal – this is a very sticky dough. Tried this recipe and the buns turned out really good. 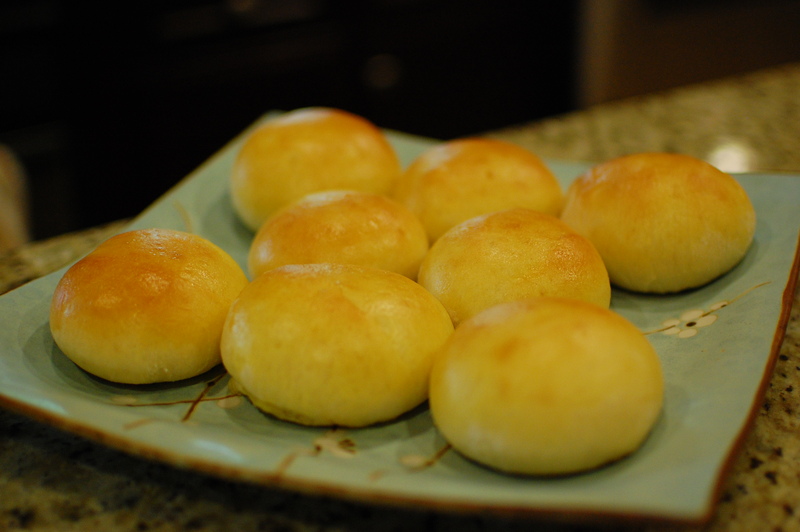 Used all purpose flour and instant dry yeast since I had only these available yet the buns were really soft. I almost fooled my daddy into believing that these were store bought.